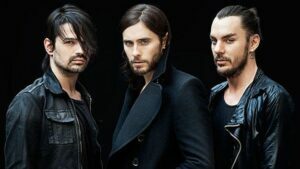 Formed in 1998 by the multitalented Jared Leto,who is also a widely acclaimed actor, 30 Seconds to Mars have released four studio albums to date and are currently touring in support of their most recent release. In 2010 30 Seconds to Mars won the Kerrang Award for best international group and recently they released their concept album Love, Lust, Faith and Dreams which was well-received and a top ten hit in both the US and UK. Thirty Seconds to Mars are: lead vocalist/guitarist Jared Leto, drummer Shannon Leto and lead guitarist/keyboardist Tomo Milicevic.